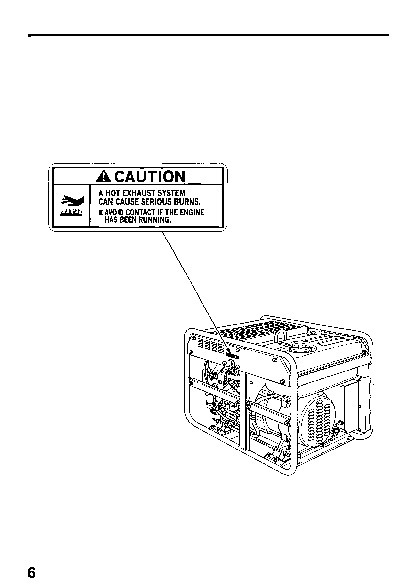 The engine exhaust from this product contains chemicals known to the State of California to cause cancer, birth defects or other reproductive harm. The generator is a potential source of electrical shock if misused. 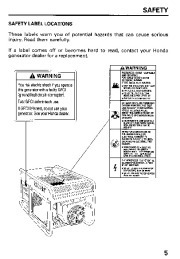 Do not expose the generator to moisture, rain or snow. Do not let the generator get wet,and do not operate iU with wethands. 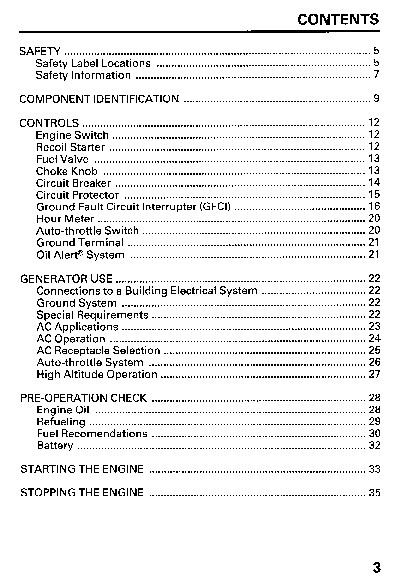 Keep this owner’s manual handy, so you can refer to it a t any time. 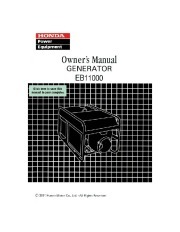 This owner’s manual is considered a permanent part of the generator and should remain with the generator if resold. 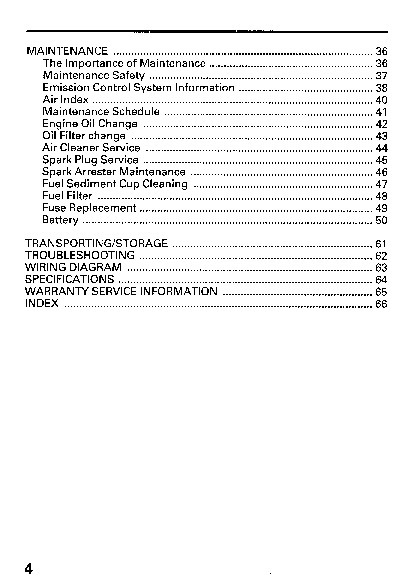 The information and specifications included in this publication were in effect at thetimeofapprovalforprinting. 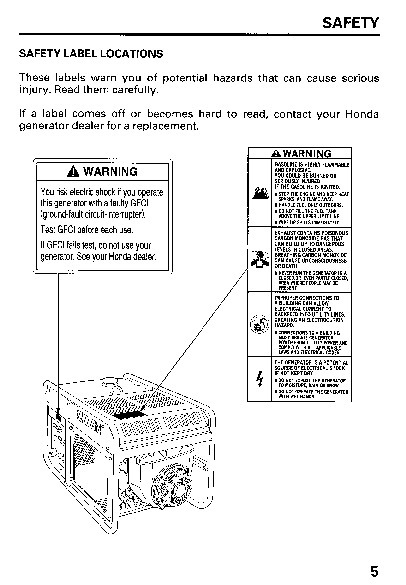 Honda Motor Co., Ltd. reserves the right, however, to discontinue or change specifications o design a t any time without notice and without incurring any obligatio whatever. No partofthispublicationmay be reproducedwithout written permission. Congratulationsonyourselectionof a Hondagenerator. We are certain you will be pleased with your purchase of one of the finest generators on the market. We want to help you get the results from your new generator and best to operate it safely. This manual contains the information on how to do that; please read it carefully. As you read this manual, you will find information preceded by a symbol. 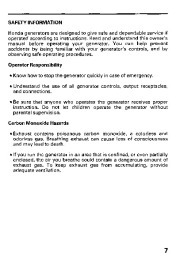 That information is intended help avoid to you damage to your generator, other property, or the environment. its We suggestyoureadthewarrantypolicytofullyunderstand coverage and your responsibilities of ownership. The warranty policy is a separate document that should have been given to you by your dealer. 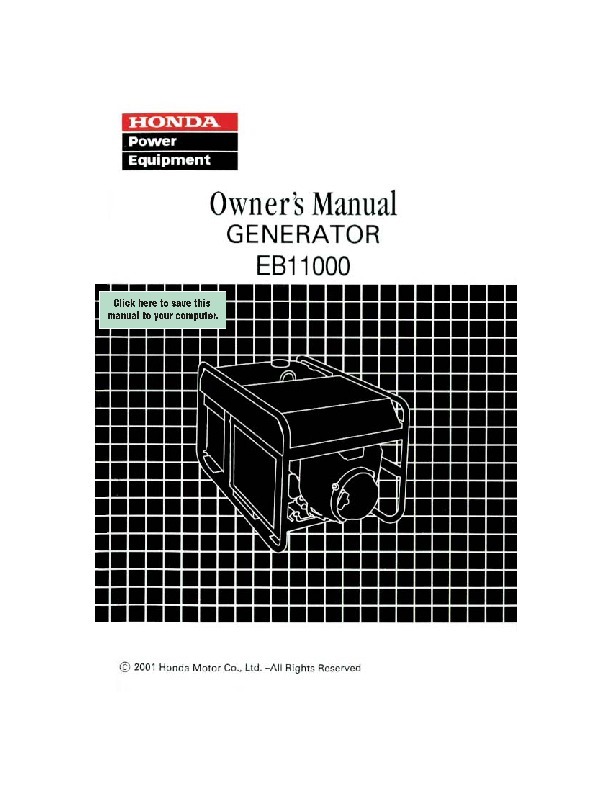 Whenyourgenerator needs scheduledmaintenance, keep in mind thatyourHondaservicingdealer is speciallytrained in servicing Honda generators. 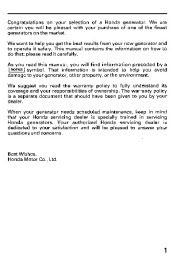 authorized Your Honda servicing dealer is dedicated toyoursatisfactionandwill be pleasedtoansweryour questions andconcerns. 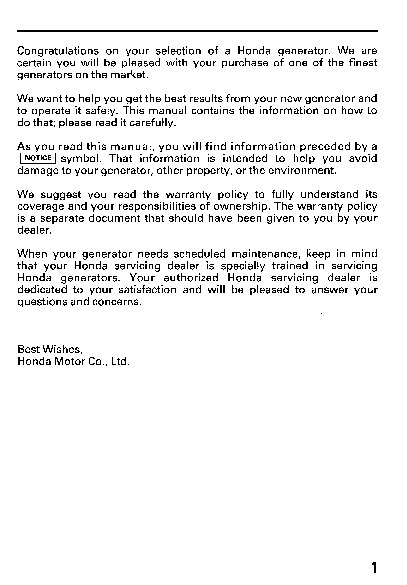 Best Wishes, Honda Motor Co., Ltd. 1 A FEW WORDS ABOUT SAFETY Your safety and the safety of others are very important. 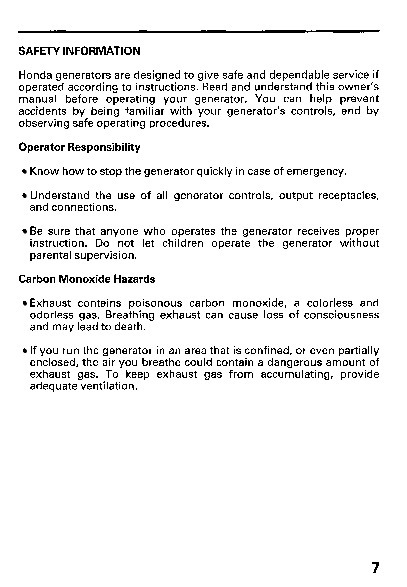 And using this generatorsafely is an important responsibility. 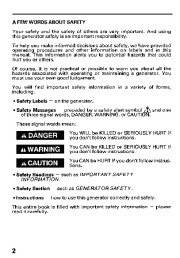 To help you make informed decisions about safety, we have provided operatingproceduresandotherinformationon labelsand inthis manual. This information alerts you to potential hazards that could hurt you or others. Of course, it is not practical or possible to warn you about all the hazards associated with operating or maintaining a generator. You must use your own good judgement. 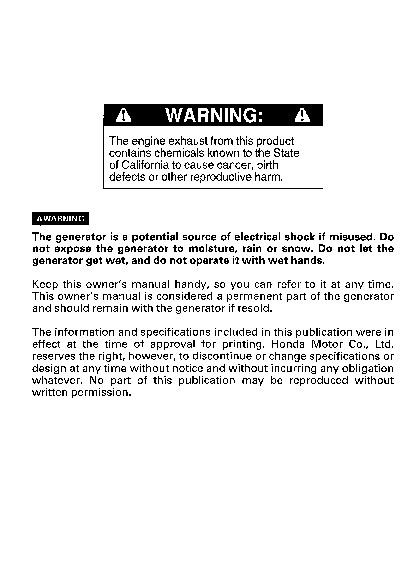 You willfindimportant including: Safety Labels – safety informationin a varietyofforms, on the generator. 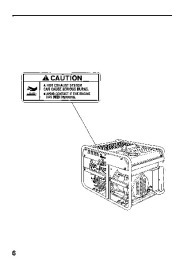 Safety Messages – preceded by a safety alert s mbol and one of three signal words, DANGER, WARNING, or AUTION. These signal words mean: You WILL be KILLED or SERIOUSLY HURT if you don’t follow instructions. You CAN be KILLED or SERIOUSLY HURT if you don’t follow instructions. z A You CAN be HURT if you don’t follow instructions. 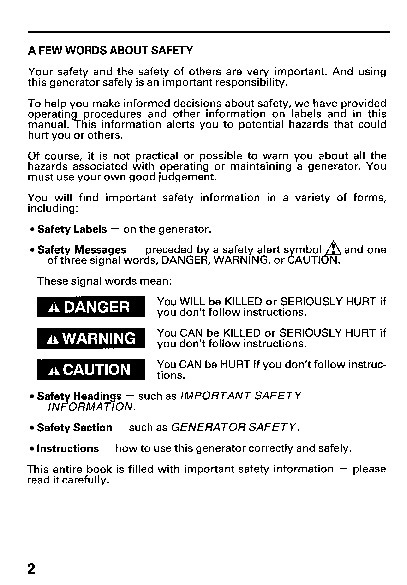 Safety Headings – such as IMPORTANT SAFETY INFORMATION. 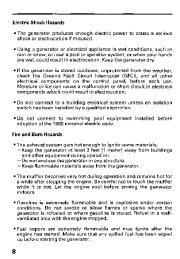 Safety Section Instructions – – such as GENERATOR SAFETY. how touse this generator correctly and safely. – This entire book is filled with important safety information read it carefully. please 2 CONTENTS SAFETY . Safety Label Locations Safety Information . COMPONENT IDENTIFICATION . CONTROLS . Engine Switch . Recoil Starter Fuel Valve . Choke Knob Circuit Breaker Circuit Protector . Ground Fault Circuit Interrupter (GFCI) Hour Meter Auto-throttle Switch . Ground Terminal Oil Alert? System . 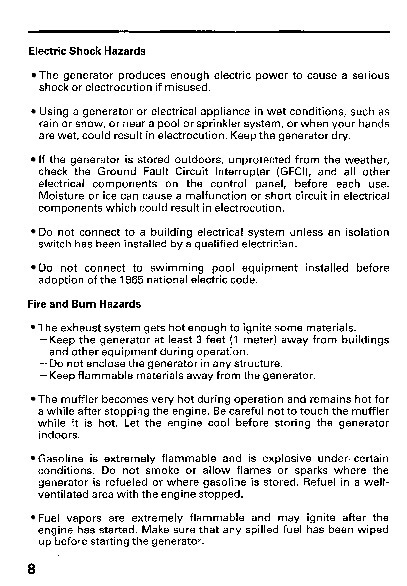 GENERATOR USE Connections to a Building Electrical System . 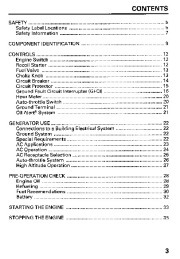 Ground System Special Requirements AC Applications AC Operation AC Receptacle Selection Auto-throttle System . High Altitude Operation . PRE-OPERATION CHECK Engine Oil . Refueling . Fuel Recomendations Battery .